Fleet Pond welcomes responsible dog owners and their dogs. We hope you will continue to enjoy the nature reserve and its wildlife. Sadly there is a minority who seem unwilling to accept that a dog can be a serious threat to the wildlife on a nature reserve and who will allow their pet to chase or harass ducks, swans and the deer. Others fail to remove dog mess or leave it lying about in plastic bags. The latter can be worse than not bagging it as someone else has to remove it. If you should witness irresponsible behaviour by a dog owner, please report this to Hart District Council’s Dog Warden Service. Try to make a note of the breed of dog and a description of the owner. Should you have concerns or a complaint regarding a dangerous dog, or if you have been harmed by a dog call the police; if your dog has been attacked by another dog, report the incident to the Council’s Dog Warden. The web link to the Hart Dog Warden service is here. 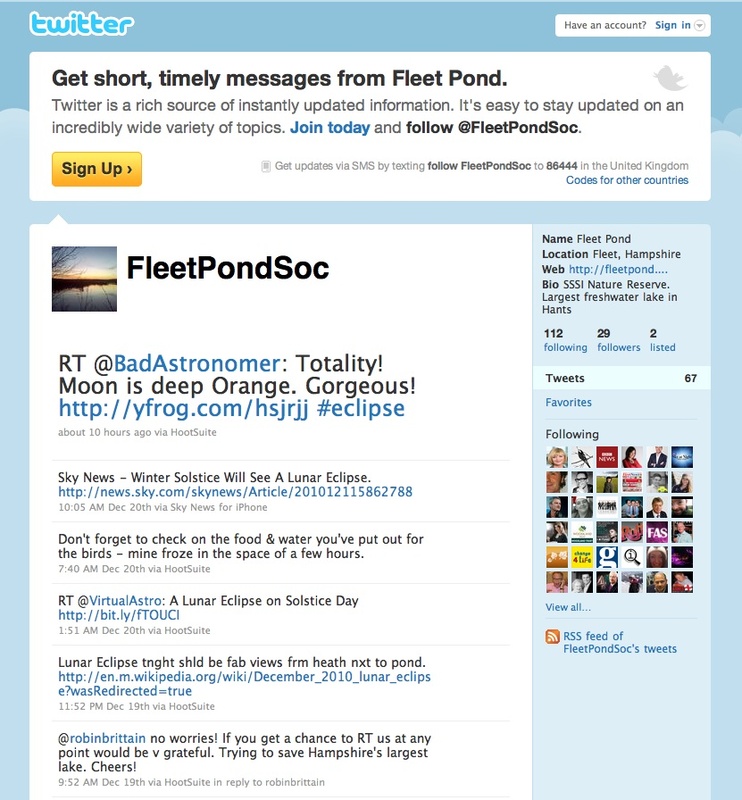 If you have an account with Twitter, be sure to tweet anything interesting you see or notice at the pond to FleetPondSoc (sample screenshot above). You can include photos by using eg TwitPic. If you’re unfamiliar with Twitter and are keen to contribute and share messages this way, then there’s a concise intro to the subject here. Volunteer Event 12 December – Holly Day! The aim of this Sunday’s task was to clear the dense holly cover in the woodland between Gelvert Glade and Fugelmere Marsh. This makes way for sunlight to the woodland floor, encouraging plant diversity. The task also contributes to the objective of introducing grazing animals to this area next season. 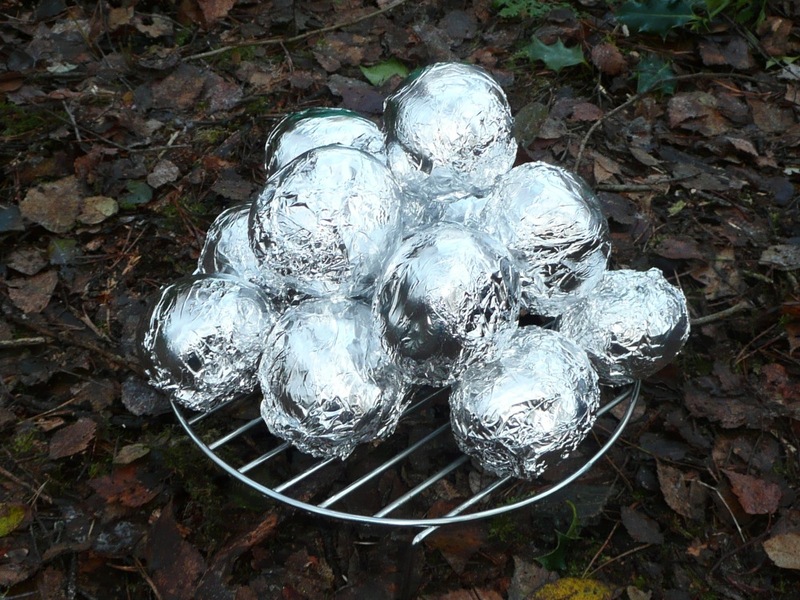 It was hoped that we’d be able to have potatoes baked in the fire at the end but this unfortunately wasn’t to be! It took quite a while to get the fire going well (as all the material to be burnt was thoroughly soaked through) and even by 11 the fire wasn’t hot enough. However, weather allowing, we hope to have another attempt at this at the next meeting in January! Getting the Fire Really Going, Helped by Some Enthusiastic Pokes! With All the Holly Removed – Quite an Enormous Difference! Hampshire’s park rangers are warning people to stay safe, and stay off frozen lakes. There is no way to tell how thick the ice is on Fleet Pond, but there are reports people are taking to the lake anyway and skating during these freezing conditions. There won’t be any park rangers working over the Christmas period and there are no public telephones there, so the worry is people could get in trouble in the freezing cold water and not get the help they need. 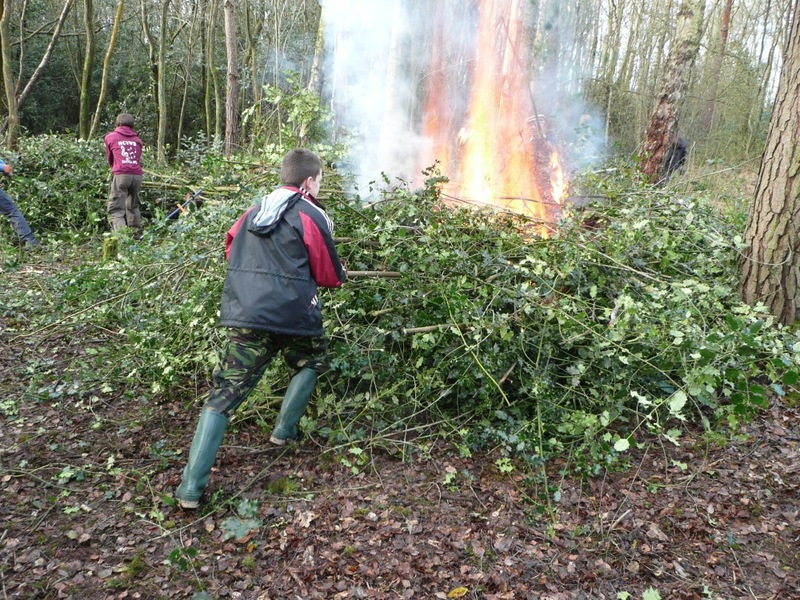 “Our task for Sunday 12th December will be to tackle the dense holly cover in the woodland between Gelvert Glade and Fugelmere Marsh. This replaces the planned marsh work because high water levels and low water temperatures would make work in the marshes very unpleasant. 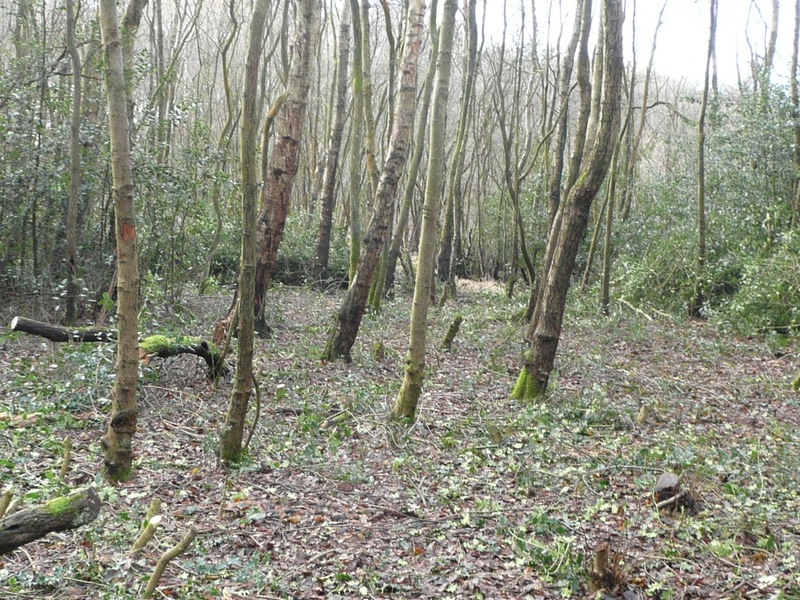 Holly creates a dense cover at the expense of woodland flowering plants so this work will help improve woodland plant diversity. 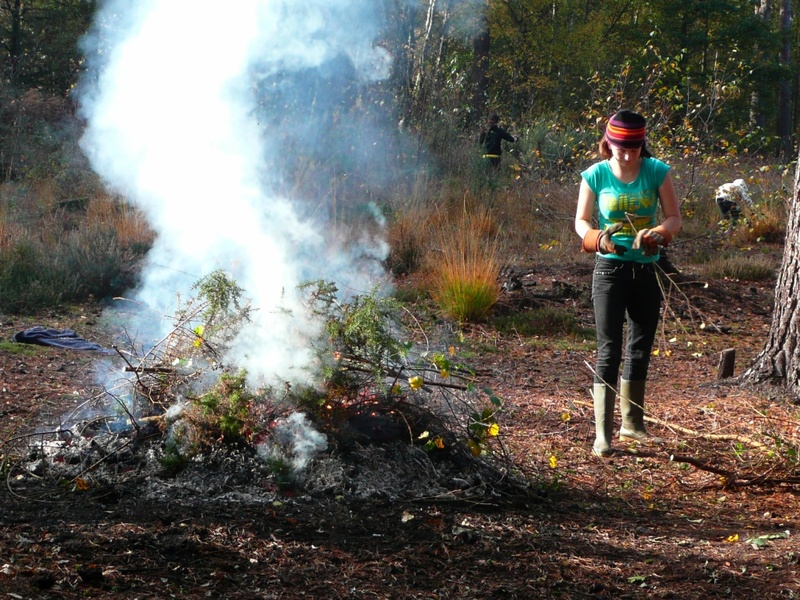 Volunteer Event 7 November – Bonfires! 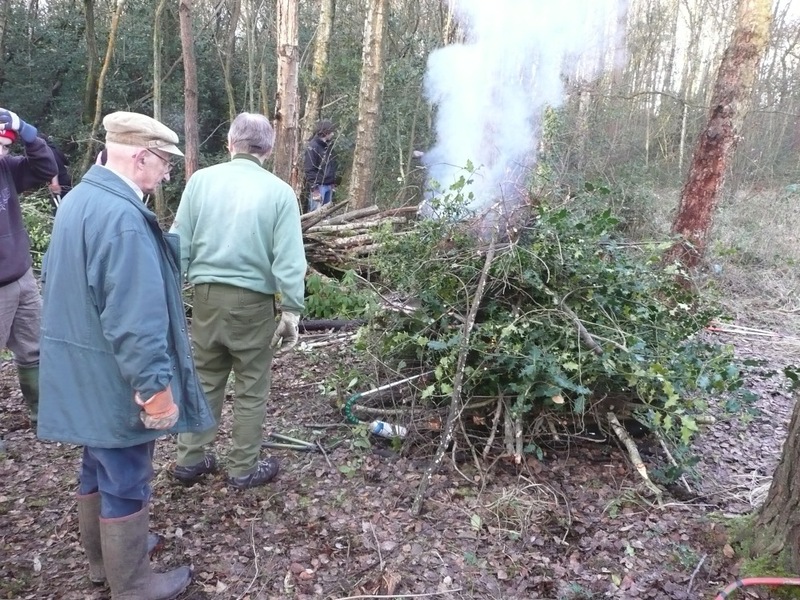 There was a lot of cut material left over from the last two work parties and, in preparation for the volunteer event, it had been moved up to the woodland by the reserve car park during the week. 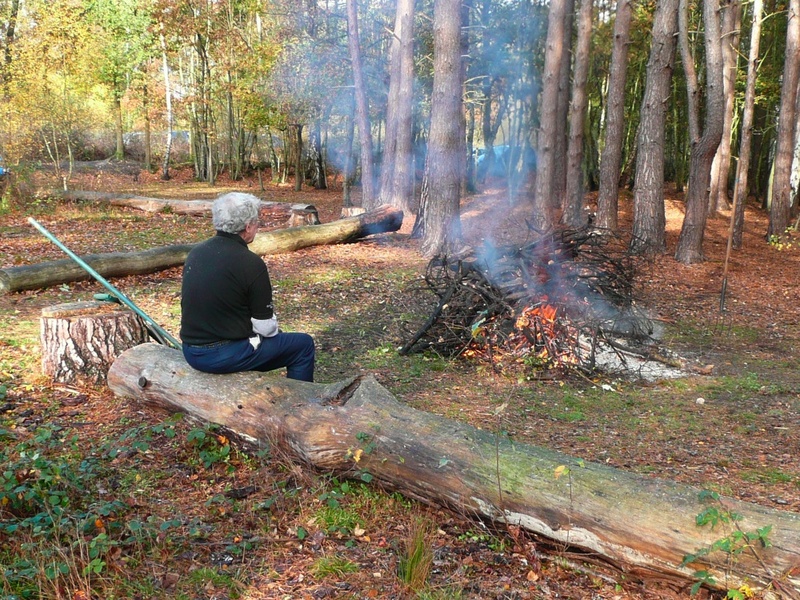 As part of the task on Sunday, two bonfires were set up to clear this material, which was rather appropriate as it was Guy Fawkes weekend! A Family Hard At Work! 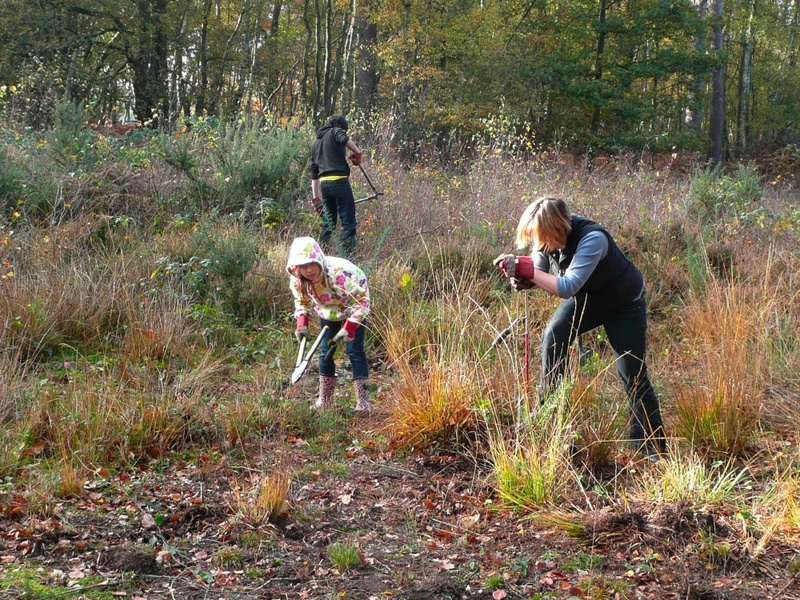 In addition there was clearance of the birch seedlings and saplings from the open heath (photo above). Next time we’ll bring potatoes along to bake in the fire – someone even suggested cooking bananas! 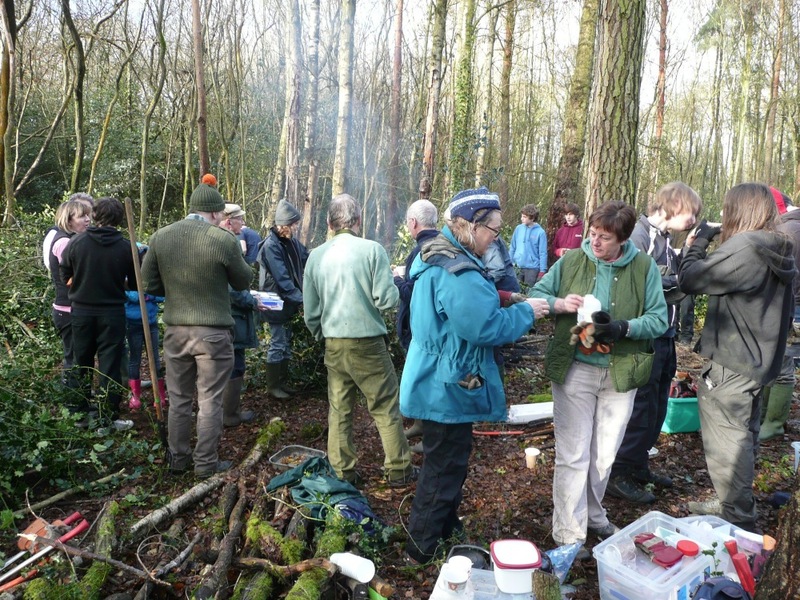 The next event will be on Sunday 12 December – all volunteers are welcome! See here for details. 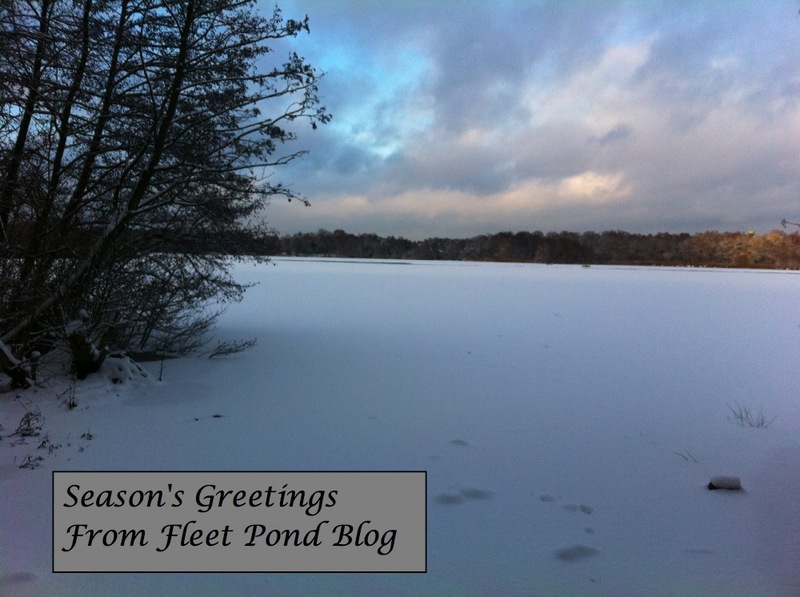 You are currently browsing the Fleet Pond Blog blog archives for December, 2010.